The Box Office window is open 12:30pm-7pm and during all performances. We are sold out of advance tickets for this show. Standing room only tickets will be available once the music starts at 8pm. 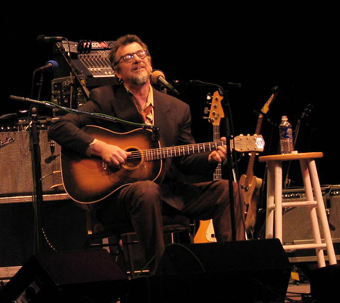 If you’ve ever seen Greg Brown in concert, you remember the voice, the deep, sometimes gruff, sometimes tender, always compelling voice that might sing – or say – just about anything. And you remember the sense of humor, in the songs and between the songs, sometimes dark, sometimes irreverent, always perfectly Greg. The songs stick in your mind too. They’re memorable enough that Willie Nelson, Carlos Santana, Ani DiFranco, Joan Baez, Jack Johnson, and Mary Chapin Carpenter have all recorded his songs. Born and raised in Iowa, based in New York City for a time, touring around the country for years on end, Greg comes by his craft honestly, developing his skills as a songwriter and as a performer over the course of a knockabout career that includes multiple Grammy nominations, frequent appearances on A Prairie Home Companion, and more than 30 albums, including his latest, Hymns to What Is Left, which Paste Magazine praises for “the unvarnished power of one man singing to nothing more than simple accompaniment on the guitar” – the kind of power “that makes you pull your car over to the side of the road and listen so that you don’t have an accident.” Greg’s shows at the Freight just about always sell out, so if you want to see this one, better get your tickets early. Listen to sample tracks from upcoming artists.